I've recently renamed a Windows 7 computer's Computer Name. Acronis has detected this as "Too Many Activations". Understandable. So, I clicked on the "I have changed hardware ..." option, whereupon it asks for the Acronis user account ID and password. I am then presented with a list of computer names and asked what this computer's old name was. So far, so good. But wait! This computer's old name is not in the list. Due to a mistake on the part of a office staff person, several earlier copies of Acronis 2017 were purchased under a different Acronis account. This computer is no doubt listed under that account. The problem is, I can't get there now. Apparently Acronis has remembered and saved the ID I initially entered and now immediately bring up the (wrong) list for old computer names. How can I get Acronis to let me re-enter a different account on this computer? This is definitely one that you need to take up with Acronis Support or go to Ekaterina via a private message for and provide her with the serial number involved etc. Have you signed out of the Acronis account in the ATI 2017 GUI Account page using the options shown against the side of the current email address shown? Steve, I am working with Ekaterina on the support area as you've suggested, but now I'm running into a new problem. 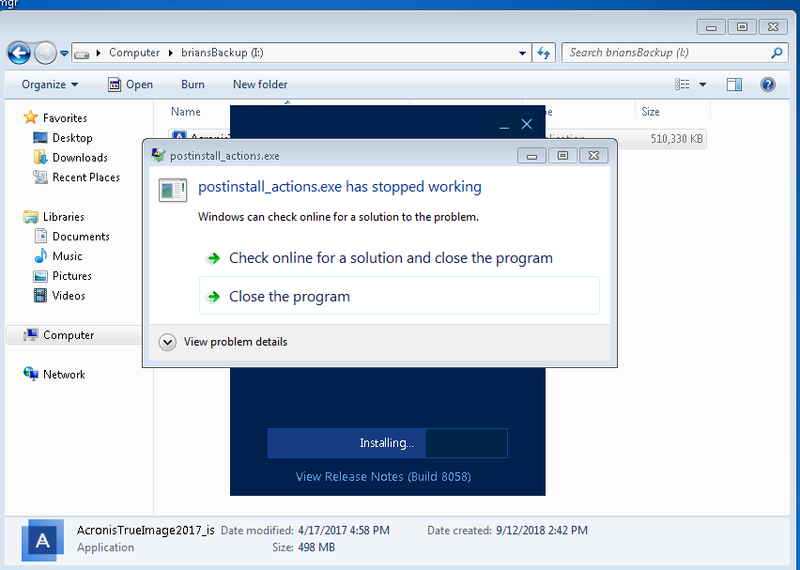 To get around the account ID being locked in after first entered, I've un-installed and reinstalled Acronis, but now when I try to install it I get "postinstall_actions.exe has stopped working", and the installation is aborted. This has happened about 4 time in a row now. I've tried installing as the normal user, the normal user with admin and as the Admin user. I've run your Cleanup Tool each time and lastly, in addition the the Clean Up tool, I've search for and deleted any Acronis related files and directories I can find. Any ideas on what is wrong and how to move forward? ATI should always be installed from an Administrator account as far as I understand, and you may also need to either suspend or whitelist the ATI executables in your security software. I have never encountered issues with 'postinstall_actions.exe' and don't remember ever seeing it mentioned before this post? I am installing from the domain Administrator account. I've also tried from the local user account who is also designated as an administrator. As my most recent try (since posting my previous message), I've removed Norton from the system and I have used the domain Administrator. It did let me install this time, though I still have my activation issue. I'm not sure removing Norton cured the problem as I have been able to install Acronis before after getting the 'postinstall' error several times. So, either removing Norton helped, or I got lucky on this latest attempt. I should note that I've been using Acronis since 2013 and have pretty much always installed as the user (with Admin rights) and have never had to remove the anti-virus software. I've attached the screen-shot for postinstall_actions.exe. Interesting that you've never heard of it. I guess I'm just lucky! Thanks for the update - I was able to find a couple of other forum posts that mention postinstall_actions.exe but no obvious conclusion other than a clean install looks to have solved the install problems (ensuring all previous ATI files/folders/registry entries were wiped). Steve - problem solved! I tried installing ATI2017 for perhaps the 6th or 8th time on this computer, but this time I did something different. Usually, when it goes to install it notifies me that there is a newer version of ATI2017 available and I get the option of installing the current version or the new version. This time, I opted to install the current version. That version was downloaded 4/17/2017 -- sorry, I did not make note of the build number. This time, it took the ATI2017 Upgrade key and the original ATI2016 key and allowed me to activate! Yeah! I did a backup to a local USB drive without updating. Then I updated to the latest version and backed up to a network drive. Both worked, no license issues. I've let this run for a couple of days to be sure (if a couple of days is long enough ...) and it's still backing up and no license messages when I open ATI. I believe this problem is solved. This should be an odd one for your collection! Very strange! Thanks for sharing this information!